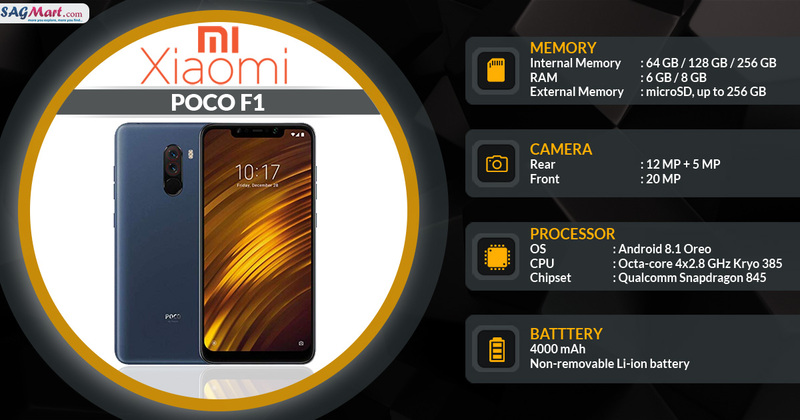 Xiaomi Poco F1 smartphone has a Dual rear camera and fingerprint sensor. The Dual-SIM mobile is powered by an Octa-core (4x2.8 GHz Kryo 385 Gold & 4x1.8 GHz Kryo 385 Silver), Qualcomm SDM845 Snapdragon 845 processor with 6/8GB of RAM and 64/128/256GB internal storage. The device runs on the Android 8.1 Oreo operating system and sports a 6.18-inch IPS LCD Capacitive touchscreen (1080x2246 pixels) display. It embedded with a 12+5-megapixel Dual primary camera and 20-megapixel front camera for selfies and 4000mAh Non-removable Li-ion Battery. The connectivity option includes 4G LTE, 3G, GPS, Bluetooth v5.0, USB Type-C, Wi-Fi 802.11 a/b/g/n/ac.